The Boeing Phantom Works X-51A vehicle with Pratt & Whitney Rocketdyne SJY61 scramjet hangs on B-52H wing mount under full moon. Note precise shape of nose to sculpture shock wave entering the inlet and overall design of vehicle to facilitate waverider aerodynamics. Photo: Pratt & Whitney Rocketdyne. The first hypersonic X-51 scramjet powered long-duration flights to give the Pentagon a new "Prompt Global Strike" capability that ties atmospheric and space propulsion will begin as early as May 25 at Edwards Air Force Base, Calif. The X-vehicle scramjet flight tests are also a key step for the use of air breathing propulsion to launch into space. As spectacular as space shuttle flights still are, they are also about the past. Scramjet propulsion is about the future. Unlike rocket engines, scramjets (supersonic combustion ramjets) are air-breathing engines that inhale oxygen from the atmosphere to achieve near rocket engine velocities and altitudes without carrying tons of oxidizer supplies. Scramjets should eventually enable flights to hypersonic near-space velocities and altitudes, just like high performance jet engines propelled the Anglo-French Concorde to supersonic speeds in the upper atmosphere. The tests will be flown by four unmanned X-51 "Waverider" vehicles developed by a team including the U.S. Air Force, the Defense Advanced Research Projects Agency, NASA, Boeing Phantom Works and Pratt & Whitney. This air-breathing scramjet capability is expected by about 2025 to begin a revolution in U.S. space launch capability especially for rapid, aircraft-like launch of small, but critical U.S. military spacecraft. If the X-51 tests are successful, President Barack Obama is also ready to approve a revolutionary scramjet-powered conventionally-armed "Prompt Global Strike" missile. Within 60 min. of launch from Vandenberg Air Force Base, Calif., this scramjet-powered hypersonic missile could strike anywhere on Earth with extraordinary kinetic impact energy. The Defense Dept./NASA X-51 program is the most critical element of this new weapons system concept. The Prompt Strike program is directly under former astronaut Air Force Gen. Kevin Chilton, who heads U.S. Strategic Command, the successor to the Strategic Air Command in the post-Cold War world. This new capability would give the U.S. a new conventionally-armed fast strike weapon that could be readily used on priority targets, as well as provide a deterrent without relying totally on destabilizing ballistic missiles, even if the ICBMs are conventionally-armed. Flying at 4,000 mph, the Prompt Strike scramjet could reach terrorists or threatening Iranian or North Korean missiles on their launch pads much faster than subsonic cruise missiles. The need is illustrated by an August 1998 Navy Tomahawk cruise missile strike ordered by President Bill Clinton that arrived on target just minutes too late to kill Osama Bin Laden. "Each X-51 will fly for several minutes and travel hundreds of miles in what will be the first practical demonstration of scramjet technology," says Charlie Brink, the X-51A program manager at the Air Force Research Laboratory (AFRL), Wright-Patterson Air Force Base, Ohio. 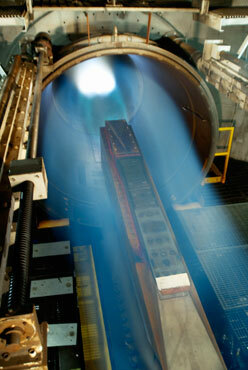 Pratt & Whitney Rocketdyne SJY61 scramjet engine for the first X-51A flight undergoes final firing test in NASA Langley hypersonic wind tunnel. Blue haze is Mach 4-5 air flow blowing from right to left across scramjet engine firing with its inlet facing up as it will be ignited over the Pacific Ocean. Photo: Pratt & Whitney Rocketdyne/NASA. While the first priority is development of a Prompt Strike missile by about 2015, the scramjet is more broadly "all about space lift," says Brink. "That is the application that AFRL is most excited about," he says. After dropping from a B-52H at 49,000 ft., the X-51 will be powered straight up by a solid rocket motor from the Army Tactical Ballistic Missile Program. Rolling gently for stabilization, each X-51 will climb to about 60,000 ft. and Mach 4, where the solid motor will be separated. The X-51's scramjet, fueled and cooled by conventional JP-7 based kerosene, will then complete the climb to about 100,000 ft. firing for a planned 300 sec. while accelerating to Mach 6.5 -- more than 4,000 mph. Pratt & Whitney graphics show the vehicle inverted, with its inlet on top at ignition, prior to a final roll to complete the run with its inlet to nadir. As the space shuttle and its 35-year-old technology is phased out, the Air Force, NASA and Obama administration see a bright future for a range of scramjet-powered vehicles that would cross the boundary between the atmosphere and space for more aircraft-type operations to and from orbit. In addition to air-breathing space launch, scramjet/ramjet combinations would also enable air-breathing engine-powered landings instead of higher risk unpowered glides like the space shuttle is required to use. As a strategic technology project, the scramjet development will proceed no matter what happens in the near-term shift to commercial crew and cargo launch to the International Space Station. If the four X-51 flights are even partially successful, they should hasten the development of advanced air-breathing engines for horizontal takeoff space launch vehicles. The NASA Glenn Research Center in Cleveland, Ohio, for example, has done extensive research on an unmanned 130,000 lb. scramjet-powered winged reusable spaceplane concept called "Trailblazer" that could carry 300 lb. payloads into orbit. The U.S. Defense Dept. 's Hypersonic Roadmap is also heavily oriented to new U.S. space access capabilities as well as missile or reconnaissance air vehicle applications. These scramjet applications would fulfill a major U.S. Air Force requirement for a Responsive Space Access (RSA) military launcher that would involve the seamless integration of "air-to-space" capability. "It is to enable the ability to get to space, return to Earth, then get back to space with an aircraft-like operations tempo," according to the Pentagon's Hypersonic Roadmap, a formal strategy governing the growing number of scramjet-related developments being pursued by the U.S. military and NASA. 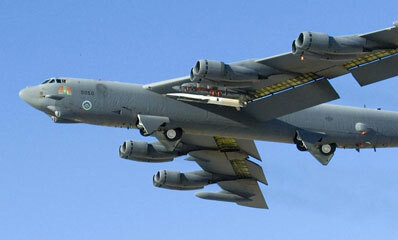 Each X-51 will be dropped from a B-52 bomber flying south over the Pacific following takeoff from Edwards. Each X-51 is 26 ft. long and weighs 2,000 lb. The 26 ft. long, 2,000 lb. 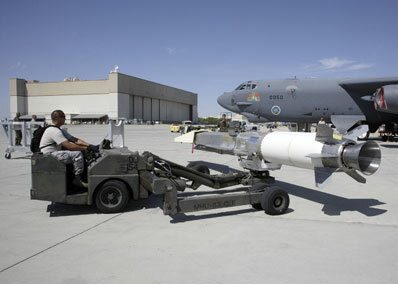 X-51A Waverider scramjet/solid rocket motor combination are transported to the B-52H drop aircraft at Edwards Air Force Base, Calif., prior to a captive carry test. Photo: USAF. One U.S. Air Force Research Laboratory (AFRL) concept for future applications depicts a reusable Concorde-sized hypersonic transport equipped with four X-51 type scramjet engines. Carried on its back in the concept is a USAF X-37 type unmanned spaceplane like that currently undergoing tests in space after launch from Cape Canaveral on an Atlas 5. The tests getting underway this month were to have begun in February or March but were delayed when initial B-52 captive carry tests found the coordination of chase aircraft and telemetry acquisition required greater definition, project sources said. The X-51s will use a Pratt & Whitney SJY61 scramjet engine to accelerate to Mach 6.5-7 while "waveriding" atop their own shock wave to enhance both aerodynamic and engine performance. An equally high scramjet goal is development by 2025 of an "operationally responsive space lift capability with 'aircraft type' operations," according to Dr. William U. Borger, former head of the AFRL Propulsion Directorate, which developed the X-51s. He cited the scramjet as one of the top four air-breathing propulsion developments in the history of aviation. Phase 1 was the Wright Brothers' 1903 Wright Flyer that conquered the power-to-weight ratio necessary for human flight. Phase 2, begun in the 1950s, was the development of the jet engine that "revolutionized the shape and speed of aerospace vehicles," Borger said. In Phase 3 by 1970, large high bypass ratio turbofan engines enabled the development of jumbo jets like the Boeing 747, while Phase 4 is the present era of scramjet development that will "enable sustained hypersonic flight and routine access to space," he said prior to his recent retirement from AFRL. USAF B-52H carries X-51A under its left wing during a captive test flight from Edwards AFB in advance of first firing. Photo: USAF. In addition to Pratt & Whitney, the Utah-based Alliant Techsystems (ATK) that produces space shuttle solid rocket motors has also been heavily involved in scramjet development and could also someday be involved in scramjet engine production. The U.S. is also mindful about international competition in this important new propulsion sector. More than a dozen countries have done some level of scramjet component development. China has a large scramjet technology effort underway, while Russia and France have also done scramjet work, some of it cooperatively. Australia is also doing significant scramjet component testing in cooperation with the U.S. But the X-51 is the first scramjet flight test vehicle designed for long-duration flight. Edwards Air Force Base has not hosted such high speed powered flight test since the end of the X-15 rocket plane program in 1968. John Armstrong, who heads the Hypersonic Joint Task Force at Edwards, says that the X-51 has returned the excitement of the X-15 program back to the legendary flight test center in the Mojave Desert east of Los Angeles. There are major differences in a scramjet engine from any other air-breathing powerplant. The airflow inside a regular jet engine must be kept at subsonic velocities for it to maintain combustion as the air moves through dozens of rotating turbine blades. Even if an aircraft is flying at supersonic speed, the airflow through traditional jet engines must be slowed to subsonic speed by the inlet for the engine to function. In a scramjet engine, the opposite is true. A scramjet has no moving parts and the airflow through it must be kept at supersonic flow speeds. The scramjet's engine inlet is also an inherent part of the vehicle's overall shape. The overall inlet shape of the entire X-51 resembles what any larger scramjet-powered aerospace vehicle will also look like. This is because scramjet-powered vehicles are essentially large flying inlets that sculpture their aerodynamic shock waves for ingestion by the engine, and in the case of a waverider like the X-51, use the shockwave to push them upward as if generating lift. Those conditions are achieved by understanding and harnessing extremely complex flow fields. This enables scramjets to propel vehicles at up to about Mach 15 at altitudes where the upper atmosphere transitions to the vacuum of space. Future vehicles flying that fast in the upper atmosphere will need the same kind of thermal protection pioneered by the space shuttle for reentry starting at Mach 25. This is why scramjets are an example of the type of revolutionary propulsion that President Obama says will be needed for future space operations. The Obama administration seeks more than $200 million in scramjet/Prompt Strike related development in the next budget year. Substantially more federal development work is already being done on scramjets to get from Earth into space, then even deep space propulsion for accelerating faster once in space to reach distant targets. More than a billion dollars in scramjet technology work has been completed and the X-51 program has totaled about $200 million. President Ronald Reagan in the mid-1980s called for development of the X-30 National Aerospace Plane, a scramjet-powered vehicle that could demonstrate the capability to fly from New York to Tokyo in three hours. NASA, the Air Force and Defense Advanced Research Projects Agency never developed a flying model, but they pioneered technology that is now making scramjet propulsion a reality. Presidents George H. Bush, Bill Clinton and George W. Bush continued the technology work begun under Reagan. That, in turn, has put the Obama administration in position to approve development of a scramjet missile to broaden strategic strike options. X-51 missile development would also speed scramjet development for space launch. Future scramjet-powered space launch vehicles could reduce launch costs and greatly increase launch flexibility because they could make aircraft-type runway takeoffs accelerating to about 60 percent orbital velocity without the need to carry heavy oxidizer and tankage. In an earlier $240 million test program, the smaller NASA X-43A hydrogen gas-powered scramjet accelerated to Mach 9.6, or nearly 7,000 mph, during a 10 sec. flight. It was dropped from the NASA Dryden Flight Research Center's B-52, then boosted to its scramjet start speed by a Pegasus rocket motor. Before complex computer modeling of internal air flow fields made scramjet propulsion possible, hypersonic velocities could only be reached using rocket engine-powered vehicles with a large percentage of mass devoted to oxidizer carried in heavy metal tanks. 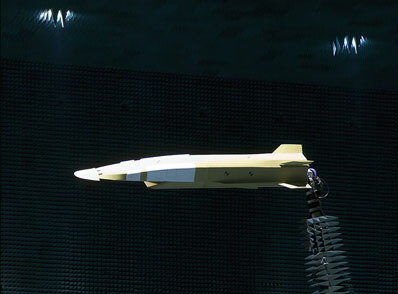 Full scale X-51 model is mounted in anechoic chamber showing the vehicle as it will look accelerating on its scramjet engine after separation of the solid motor that will boost it to Mach 4. Photo: USAF. At tests that will be separated by several weeks, each X-51 will be dropped from a wing pylon on an operational B-52H bomber flying at nearly 50,000 ft. over the Pacific Ocean off the California coast. The X-51s will not be as fast as the X-43 flown in 2004, but it will use far more common JP-7 kerosene fuel and a unique cooling design for a much longer flight of nearly 400 mi. With a larger fuel tank, the X-51's engine could run for as long as a mission dictates, says Brink. For missions into space, future scramjet-powered vehicles should achieve speeds approaching Mach 15 on air-breathing engines consuming oxygen from the atmosphere before a transition to rocket power using oxidizer carried on board to accelerate to Mach 25 velocities required to achieve orbit. After the B-52H takeoff from Edwards, each X-51 will be dropped over the Pacific Ocean above the highly instrumented Point Mugu Naval Air Warfare Sea Range, 50 mi. north of Los Angeles. Years of Pratt & Whitney engineering and internal engine flow modeling have come together to make the X-51 a true stepping stone to operational scramjet operations for eventual air-breathing missions to space. "We believe the X-51 will lead the path to practical air breathing hypersonic flight," said George Thum, Pratt & Whitney Rocketdyne X-51A program manager. As the engine ignites, it will initially burn a mix of ethylene and JP-7 fuel before switching exclusively to JP-7. The use of a standard JP hydrocarbon fuel like an operational system would use is an important part of the test. There will be 270 lb. JP-7 on board each X-51. Dean Andreadis, a specialist in flowpath aerothermal analysis and systems integration at Pratt & Whitney Space Propulsion Hypersonics in West Palm Beach, Fla., summarized the scramjet's remarkable internal flow characteristics for the website "Industrial Physicist." It illustrates what the Pratt & Whitney engineers have mastered to make the X-51 a reality. "The scramjet's high-speed air-induction system consists of the vehicle forebody and internal inlet, which capture and compress air for processing by the engine's other components. Unlike jet engines, vehicles flying at high supersonic or hypersonic speeds can achieve adequate compression without a mechanical compressor," says Andreadis. 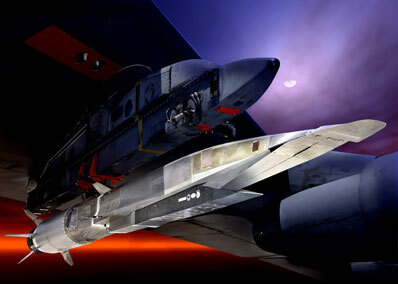 In the scramjet, "the forebody provides the initial compression and the internal inlet provides the final compression. Although remaining supersonic, the air undergoes a reduction in Mach number and an increase in pressure and temperature as it passes through shock waves at the forebody and internal inlet. The isolator, visible on the flow path diagram, is a critical component. It allows supersonic flow to adjust to a static back-pressure higher than the inlet static pressure," he says. "The isolator enables the combustor to achieve the induced rise in combustor pressure without creating a condition called an "inlet unstart," in which shock waves prevent airflow from entering the isolator. The combustor accepts the airflow and provides efficient fuel-air mixing at several points along its length, which optimizes engine thrust," said Andreadis in his presentation. Basic X-30 National Aerospace Plane shape illustrates key elements of a scramjet engine, like in the X-51, with key shock and pressure waves in and around the vehicle during hypersonic flight. Graphic: USAF. The scramjet will circulate the fuel behind engine walls to cool the structures. 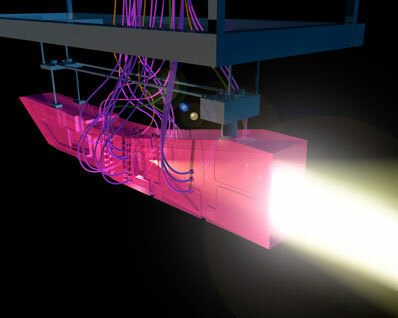 Without such active cooling, the temperatures in a scramjet could reach 5,000 deg. Fahrenheit, high enough to melt virtually any metal on Earth. Solving the cooling challenge is a major AFRL/Pratt & Whitney achievement. In an operational design, the engine will be configured as a ramjet for acceleration to Mach 4 before it changes geometry for scram operations. As the vehicle reaches Mach 4 ignition conditions, air is compressed on the lower surface of the vehicle and enters the engine inlet at high pressure. In a conventional jet engine, turbine blades are used to compress the air after the inlet has slowed it to subsonic speed. In a scramjet powered vehicle already going Mach 4, the air entering the engine is already well compressed, and is squeezed down further, but remaining at supersonic velocity. This supersonic compressed air then is mixed with fuel in the combustion chamber where the air and fuel ignite within 0.001 sec. of meeting each other. The fuel must enter the combustor in a vaporized condition or it will not ignite. How Pratt & Whitney achieves this vaporized fuel condition is why the X-51 engine is a revolutionary flight weight design, nearly ready for scale-up in an operational design for a Prompt Global Strike missile. The JP-7 fuel is first pumped into tiny passages behind engine walls at the front of the engine. It flows behind the walls of hot engine structure cooling the engine until it reaches the rear of the scramjet. There is more going on than cooling, however. The passages behind the engine walls are coated with a catalyst material. As the JP-7 absorbs heat from the structure, the fuel's temperature and pressure rises until the catalyst reacts with the JP-7 and "cracks" it, literally breaking it down into smaller hydrocarbon components like hydrogen, ethylene and methane. At the rear of the engine, the cracked fuel is collected and reverses course, now being pumped forward where, as a vapor, it is sprayed into the combustor and ignited. The combustion products then expand tremendously in the rear nozzle, where they fire out of the scramjet creating about 1,000 lb. of thrust. That does not sound like much, but in a test engine at 60,000-100,000 ft. with the vehicle already moving at Mach 4 at ignition, it is enough thrust to continuously accelerate the vehicle past Mach 6, if all goes well. Wind tunnel graphic illustrates how a scramjet shape is much like a flying inlet. Note square shaped exhaust nozzle. Image: NASA. The Waverider aspect of X-51 aerodynamics is also at work at this time. The shock waves generated by the vehicle moving through rarefied atmosphere at about 4,000 mph would normally create drag, but the X-51 design is shaped to turn shock waves into an advantage. The shape of the vehicle vectors the shock waves so that they lift the vehicle, pushing upward on the X-51 structure while also entering the inlet at a proper angle. Each X-51 is designed then to fly about 350-400 mi. before fuel depletion. Telemetry on 300 elements of the vehicle will be transmitted to the Pt. Mugu control room manned by 35 scramjet project personnel. A Navy P-3 Orion relay aircraft will also be positioned under the ground track to relay data. All four flights will share one goal, "to light off and accelerate through as many Mach numbers as we can," says Brink. As with any complex flight test program, he expects things will go wrong during the flights and he will be happy if only two of four tests are successful. The 300 sec. of flight will be followed by a 500 sec. dive into the Pacific. The four X-51s will not be recovered, but future test vehicles may carry recovery parachutes.